Wilwood Colored Calipers Are Now Available! When a project dictates that “off-the-shelf” just won’t do, Wilwood Colored Calipers provide the right finishing touch to those one-of-a-kind builds. 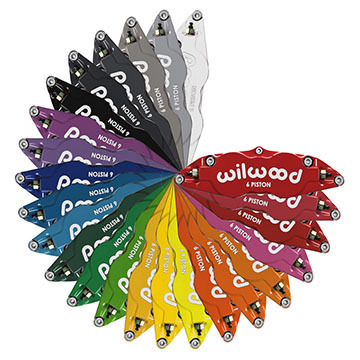 Twenty four colors, including our signature gloss black and competition red, can be combined with a choice of bold print black, silver, white, blue or red Wilwood logos. Colored calipers can be special ordered with kits, or in sets of nearly every caliper Wilwood manufactures.